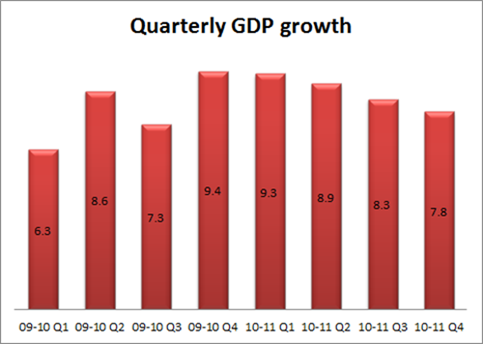 Back in 2006-2007, anything & everything about Indian Economy was looking rosy – The GDP growth was consistently around 8.5% to 9%, one of the highest in the world. Infact, many analysts even said that in couple of years time, India will be logging 10% + GDP growth rate. In 2008 – 2009, global recession brought down the GDP growth rates, but still India was performing quite well logging about 8% growth rate. In 2010, everyone was quite happy that India came out of the recession relatively unscathed – Most of the analysts expected that 2011-2012 will bring back the high growth rates experienced earlier in 2007. For the financial year ending March 2011, India’s logged yearly GDP growth rate of 8.5% just below the expected 8.6%, half a percentage point over the 8.0% growth logged a year earlier. According to numbers released, the drop in GDP was primarily on account of lower than expected performance in ‘mining and quarrying’, ‘manufacturing’ , ‘trade, hotels, transport, and communication’ and ‘financing, insurance, real estate & business services’. One of the biggest reason why economy has not grown as expected is Inflation. It has been consistently high for over 3 quarters not – It has been hovering around the double digit mark and does not look like it will be coming down anytime soon. To add to Inflation woes are the high crude prices, which threaten to put Inflation on even higher pedestal. It is expected that Indians will face another revision in crude pricing next month. Even the Stock Market has been lacklustre over last year – The BSE Sensex & Nifty have been range bound and have been trading on generally low volumes. The Foreign investors have been taking out money from Indian stock markets. There is a silver lining though, which can make a real positive difference to future economic growth as well as help in taming the inflation – Normal Monsoon. It is expected that India will experience normal monsoons this time. Indian Economy is largely dependent on Monsoons, and if the rain gods are happy, the farming output will soar bringing down the prices of Food grains and thereby Inflation! What is your take ? Which way is Indian Economy heading ?